We have discovered a new optical phenomenon, in a collaboration with Caltech, that we termed the plasmo-electric effect. 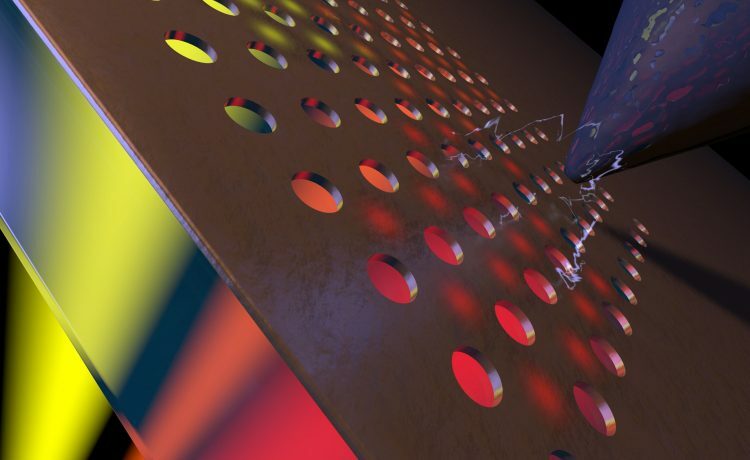 It is observed when a nanohole array in an ultrathin Au film is illuminated with monochromatic light. When these fully-metal nanostructures are illuminated with a wavelength off the plasmon resonance a large photovoltage (100 mV) is observed, with a polarity that can be controlled by the excitation wavelength. The measurements are described by a thermodynamic model we have developed in which the entropic gain due to light-induced heating is balanced by the electrostatic energy build-up due to charging. The reverse effect, a control of the plasmon resonance in Au nanocircuits under electrical excitation, was also observed.